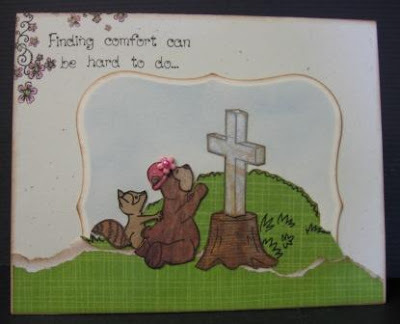 Sadly, a couple of sisters that I know lost their mother this week, so I needed to make them each a sympathy card. 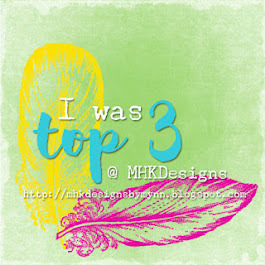 I chose to use this pretty soft CS that I bought at our LSS, O'Dear, What a Memory. It's double sided (plaid on the reverse), and is made by Chatterbox. 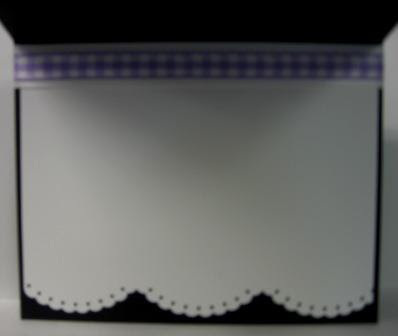 I love the softness of the pattern. 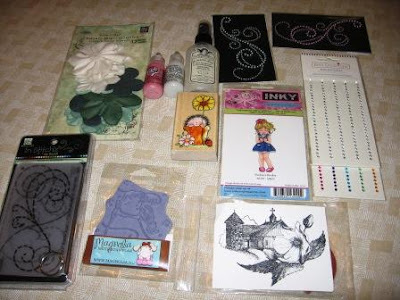 The sentiment stamp, by Verses Rubber Stamps, was purchased by my friend Shirley, from Inkeined to Stamp, and she kindly let me borrow it. 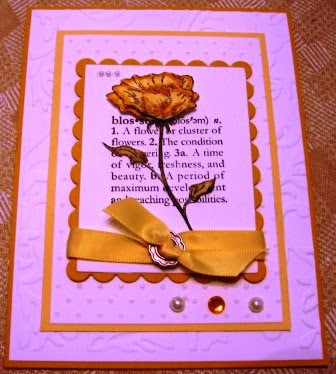 The rose, is a beautiful stamp from Inkadinkado. The ink is Denim Blue, by Adirondack. The totally perfect bows were made with my fabulous Bow Easy that Shirley gave me for my birthday. 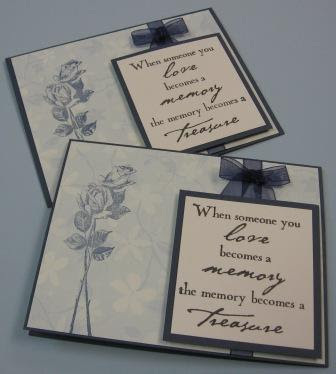 Sympathy cards, like CAS, are very hard for me. 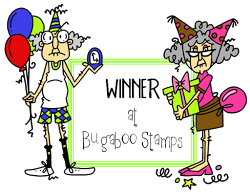 I'm always tempted to run to Hallmark, because I sit and stare at my CS and stamps, and just draw blanks. With that in mind, I think these turned out pretty. I hope you like it. Thanks for stopping by. Off I go to my hot, well warm, or maybe lukewarm bubble bath! My job tomorrow is a full day of paperwork for DH! Well, goodnight all - see you soon! 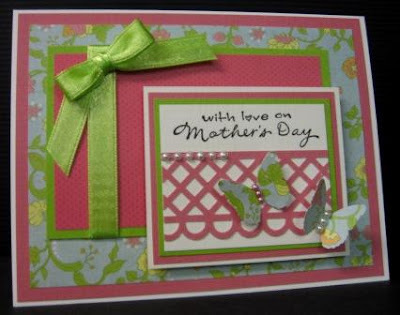 Today's challenge at Stampin' Sisters in Christ, is to make a Mother's Day Card. My dear mom passed away in December, 1999 after an on-going battle with cancer, so my mother's day card will go to someone else's mother! 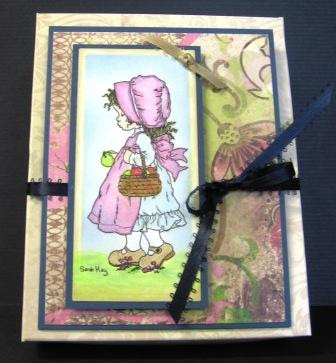 This card was inspired by a trio of cards featured in CardMaker magazine this month, (page 22) designed by Deanna Hutchsion. I liked her layout, and decided to alter it to work with an A-2 sized card. I'm cleaning a closet in the office/craft room/drop it where it lands room. This room used to be a two car garage, and now we use it for everything, and I do mean everything. This is the main door into the house (even though we have a front door and beautiful foyer, and a sunporch door)! Anyway, I am cleaning a closet in this room today. I have laughed out loud more than once. Buried in the back corners of one of the shelves was an enire stack of old floppies. Not the A drive kind of little square hard floppy, but the old 5/5" square really truly 'floppy' floppies. There were all sorts of 'how to' books for things that were outdated 20 years ago! lol... However, I have to admit, it does feel SO great to purge!!! Funny thing is, I almost have to purge everything twice, as DH thinks we need to save it 'just in case', and pulls it out of the trash when I'm not looking. Sneaky as I am, I re-purge when HE isn't looking! Back to work I go! 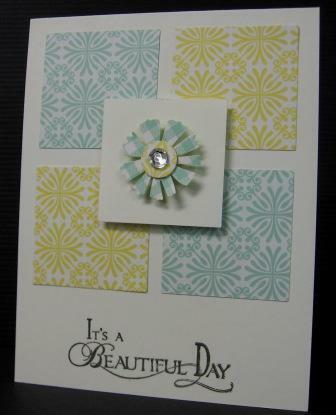 Thanks so much for stopping by - hope you like the card! 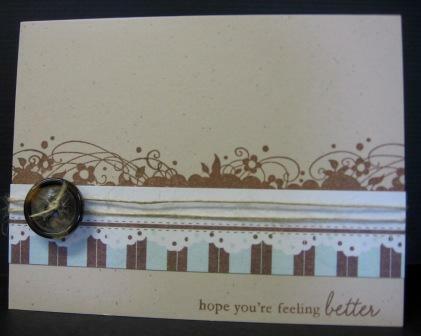 First, the card above is made with a stamp that I received in the mail this week from a friend. Thank you dear friend - you know who you are! 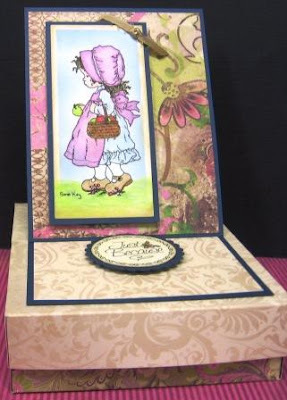 I am going to enter this sweet little winged beauty at Charisma Cardz, and Caardvarks, where the challenge is to make a monochromatic card. Hope I can squeak it in with time to spare, but I'm not too sure! 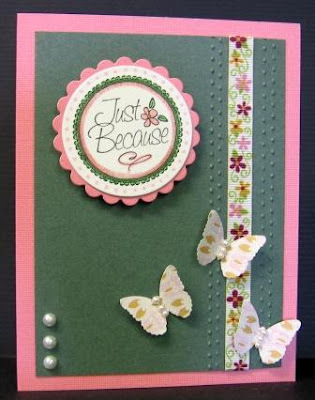 I am also going to enter it at One Stop Craft Challenge, their challenge this week is "Things with Wings". Oh... and I almost forgot - look at that beautiful PERFECT bow! My friend Shirley gave me a bow easy for my birthday! Am I good or what? Thanks Shirley! Martha Stewart paper pack from Wal-Mart - Stamp is Inkadinkado. This is a magnetic book mark! One little strip of two sided paper, and two pieces of self stick magnet that I bought at Wal-mart as well. Two sheets of 5 x 8 per package! Well, hope that you found something here that made you smile or drool! Take care - hope to see you tomorrow! The image is from Inky Impressions, the CS is from a DCWV stack. Inky Impressions: The challenge is 'charm it'. I had this little silver heart charm, and I covered it with some pretty soft pink Stickles that were in my winnings (as was the stamp image!!!) from Chris Olsen's blog candy. 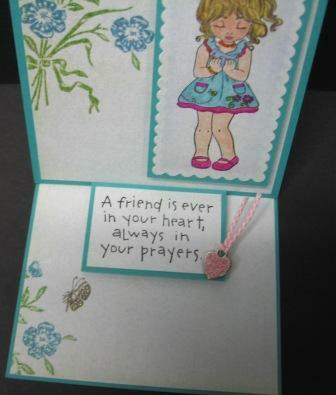 Stampin' Sisters in Christ: The challenge for Stampin' Sisters in Christ this week was to make a card or project that was about peace and/or prayer. Thanks for stopping by - cross your fingers that my computer is delieverd this weekend! So, I know it's not the weekend yet. :( I just can't help being a bit anxious! I am in high hopes that my new hero, the computer tech, will bring my desktop back to me all fixed and working good as new, or maybe a new computer with my old 'brain' in it.... either way, I am so ready to have my own machine back! Thank you so much, Melissa, if you are reading, for loaning me your retired laptop - I would have been in the looney bin without e-mail! The cards posted above were entered into contests at Stamp TV this week. 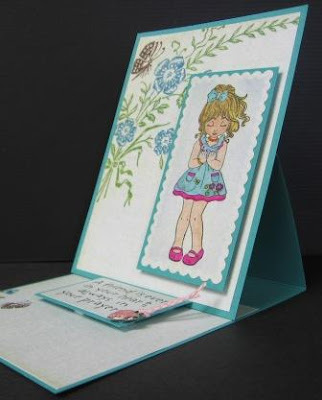 I used the GKD Spring Florals set, and colored with pencils and LOMS. The challenge for the first card required the use of glitter. I remembered a card that my BSFF Shirley helped me make in a workshop several years ago, and cased the idea. 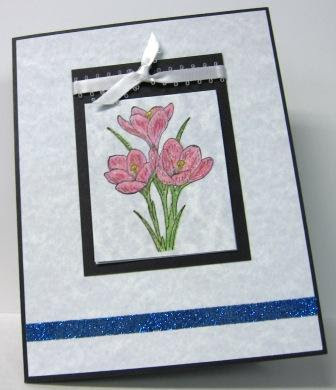 I simply added a strip of red line tape to the bottom of the card, sprinkled blue glitter, and voila! 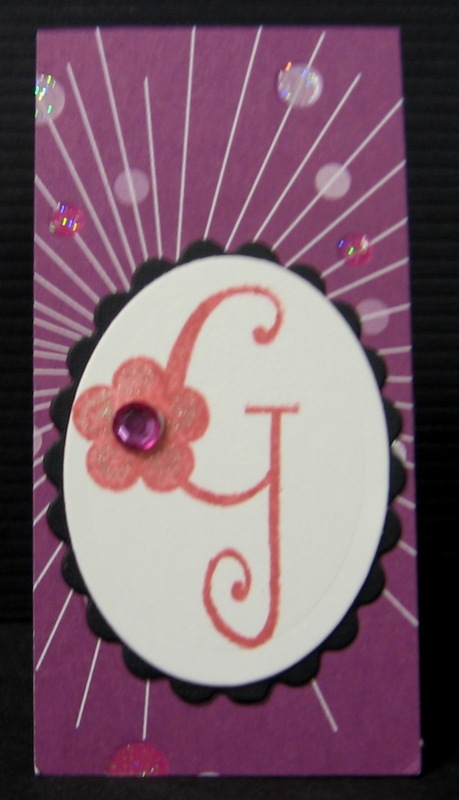 The flowers and stems were also touched with a gelly roll starburst pen for some sparkle above. 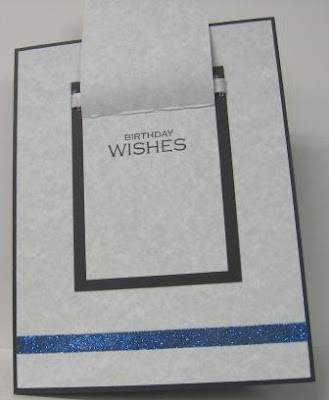 The card opens like a regular card in addition to the little flap opening. The second card was a sketch challenge. 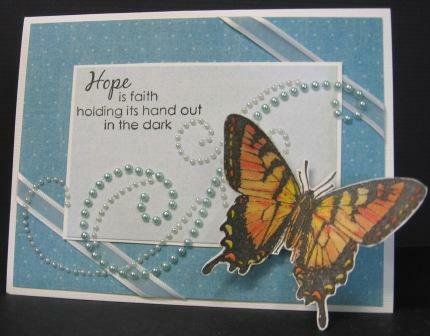 I used the GKD Hope set, colored with pencils and LOMS, cut out the butterfly, sprayed with Glimmer Mist, and adhered with a 3-d dot. 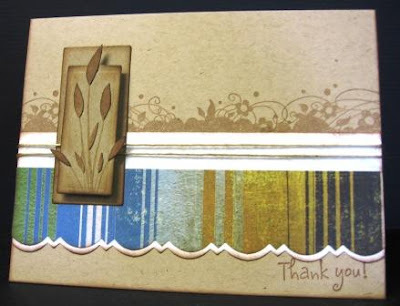 The pearl flourish is from ZVA, and was in my blog candy box from Chris Olsen that I posted last week (thank you Chris - I love these flourishes!!!). On the home front....I am about halfway finished with the upper cabinets in the kitchen. I spent the morning removing the center panels in 2 of 4 doors that are in a pass through cabinet. I am planning to put some sort of glass center in, replacing the wood. Again, I didn't take before pics - what a knucklehead I can be sometimes! Anyway, as I don't have a lot of places to 'spread out' into, it's slow going, but it is going, and is looking nicer! DH has follow up visit with doc tomorrow, am looking forward to hearing what the good doc has to say. Have you ever noticed that after Monday (M) and Tuesday (T), the rest of the week is WTF??? Lol.... I knew you'd smile! Blessings and hugs - Patti J. 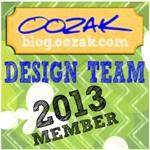 For Fun Challenges is a fairly new challenge blog. The designers are Helen, and Kym want you to have fun, relax, and make friends, while being creative! 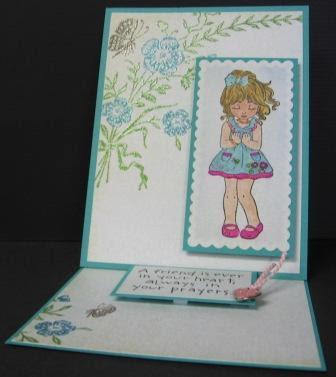 Helen asked me a few weeks ago to be a Guest Designer for today's challenge. I am thrilled to have been asked! Thanks Helen and Kym! My project this week is a box of cards. I love making boxes of any size and shape, and as you will see, this box actually has an easel card top! 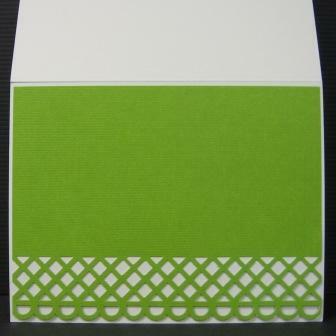 Usually, when I do an A-2 box, I make coordinating cards, all using the same cardstock and designer papers. I was in need of several cards, so this time, I made several non-coordinating cards. All items are paper pieced - no coloring! 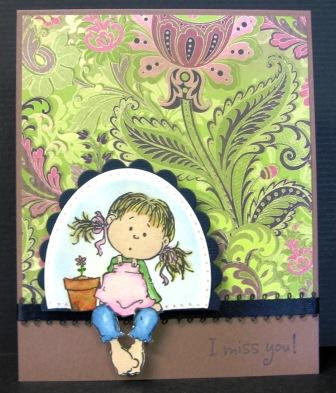 My challenge for this week's For Fun Challenges, is to make and post a card of encouragement (Thinking of you, Hello, Miss You, etc.) 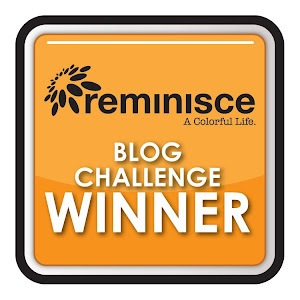 on the For Fun Challenges blog. After posting your card, I challenge you to mail it to someone that is going through a rough time, someone that needs your encouragement! Have fun!!!! Thanks again, Helen and Kym! I have excitement here in the old household! I went to the mailbox today, and guess what was in there already??? The blog candy that I won from Chris Olsen's blog! Wowzers...lookie at what was in this box (and holy cow, can that girl ever pack a tiny box to capacity)! Chris, if you are reading, many thanks. What a generous and kind gift. This beautiful card, made by Chris was the first thing that I saw when I opened the box. It may go in a frame and be hung on the wall - sorta like a trophy card. Her cards are so beautiful! What's next? OH....Caryl P. and I are excited that it's baseball season! Even though she's a diehard Yankee's fan, and I'm THE diehard Cardinal's fan, we are still friends! In fact, it's opening day in St. Louis today, and I'm watching the opening day hoopla on TV now! 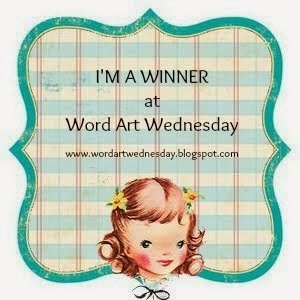 Last, I'm to be a guest designer at For Fun Challenges this week, so tune in on Wednesday! I'm so pleased and flattered that Helen and Kym asked me! What else? Hmmm... it's back to the doc with DH for check up on Friday. His leg looks pretty nasty, so I'll be curious to see what they say. Have a great day, and week! Hopefully, things will soon be back to normal around here. Update: Just got word - tech can't get my computer until the weekend.... (very sad face here). Well, DH's new computer arrived! It is at the shop right now. They are going to load all of DH's files on it. We will pick it up and test it out. If everything is on there and is okay, we will then take his existing laptop to them, and they will load all of my files on it. It's slow going, but I think there is finally light at the end of the tunnel! I may possibly be back in business by this time next week. Could it be? The car is in the shop - the alternator is shot, as well as some belt - something like serpentine? The power steering was affected by one of those things, and due to the alternator issues, the battery 'overcharged' and there is battery acid all over the engine. Long story short - here goes $700! I'm going to pick it up in an hour or so, as we need it for the surgery appt. tomorrow! The truck has to go in for not one, but two recall notices, so I will drive it down when I go for the car today (36 mile round trip) and leave it until Monday. DH returned last Sunday night from his trip to Florida to meet up with DS for spring training. Upon DH's return, the airline lost his luggage. Of course, HIS computer cables were in his bag, so we were totally without computer for 24 hours. AA did deliver the bag to our doorstep a day later, so all is well. As DH had tons of dirty ball-park style laundry, our clothes dryer decided to die. We are waiting on rollers to get here for it so that I can do some laundry! I know that I'm forgetting things, as it seems like it's been a wilder ride than this, but as of now, I just can't remember what I'm forgetting! That's what happens when you get older! With everything going on, I don't know if I will be lucky enough to get back on line this weekend or not. Thanks for your patience, and I promise to make it up to all of you when I do! I am perusing your blogs, and looking at your gorgeous creations each day, I just can't comment. For whatever reason, each comment takes 30-50 minutes to think and post! Dawn Lotharius and I share a birthday! 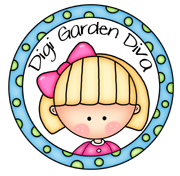 So, if you have a chance on Saturday, drop by Dawn's blog and wish her a happy birthday! Dawn, if you happen to be reading, thank you so much for my beautiful card! I hope that you received yours as well!!! 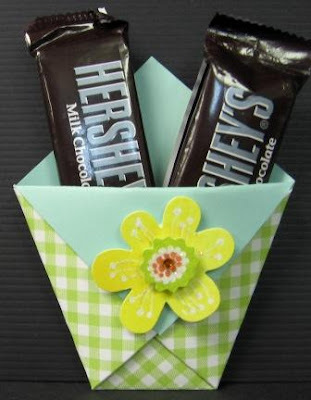 If I don't see you, have a nice Good Friday, and a safe and blessed Easter!